The use of unmanned aerial vehicles (or drones, for us civilians) to deliver medical supplies is not really new. In fact, if you hover long enough over this recent post on mayoclinic.org, you’ll find that drones were used to deliver aid packages in Haiti after the 2012 earthquake and transport “dummy TB test samples” from a small village in New Guinea. Up until now, however, that's been about it. But assuming the Federal Aviation Administration follows through on plans to lift its ban on using drones in U.S. airspace, we may see drones being used for things like transporting blood products to “critical access hospitals” and accident scenes here at home, according to Mayo’s Cornelius Thiels, D.O., who helped author a paper on the subject for Air Medical Journal. "Blood is unique, because it's expensive and expires -- platelets and thawed plasma last just five days -- and the supply is very limited," says Dr. Thiels. That means many smaller hospitals have just a small stock of blood products, and even in medium-sized hospitals, “a single patient with massive bleeding can easily deplete the blood supply." 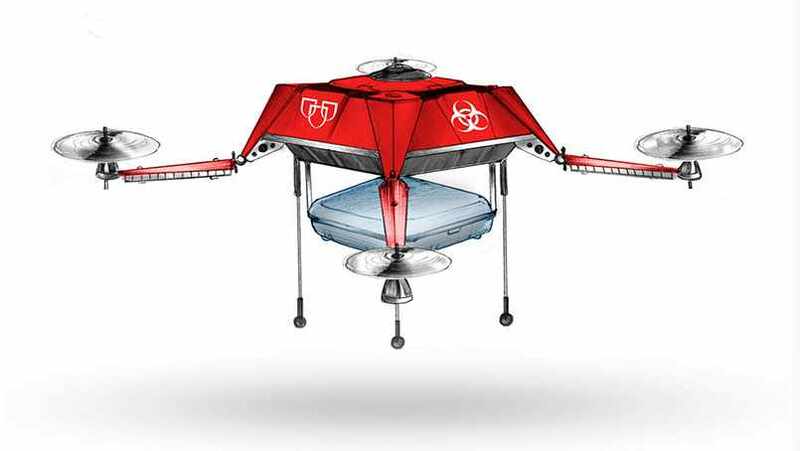 Drones could help by delivering blood to hospitals “on-demand.” Instead of using courier services or the highway patrol to transport blood products, a drone could deliver blood, taking off as soon as the an emergency call comes in. Dr. Thiels also sees potential for drone delivery of things like “defibrillators, tourniquets and other hemostatic supplies” for situations where there are large numbers of injured. “I don't know how realistic that is, but it's exciting," he says. Something that is realistic, Dr. Thiels tells the Minneapolis/St. Paul Business Journal, is the lower cost of using drones compared to sending out ambulances or helicopters. "Helicopter and even ambulance transport is extremely expensive, whereas the cost of flying a UAV is really low -- dollars per trip," he says. There’s plenty of testing and research to be done before drones can be effectively and safely used to transport medical supplies to patients. And that's research that Dr. Thiels continues, with colleagues Johnathon Aho, M.D. ; Scott Zietlow, M.D. ; and Donald Jenkins, M.D. And their work is creating buzz, thanks to that Air Medical Journal publication, and getting some pretty good air time (get it?) in publications like Good magazine, Popular Science, and our favorite, Sputnik News. You can give us your spin by sharing your comments below and then share this story with others.